A thief in Indiana was caught on surveillance video stealing a package from a front porch in broad daylight. The crime was captured on video on Tuesday afternoon, March 27, on Gray Arbor Drive in Indianapolis. Andrew Upton and Jennifer Hall installed two surveillance cameras outside their home but never thought they’d be used to solve a crime. Then a package of a rare fish they were expecting didn’t arrive despite a notification stating the package had been delivered. They checked the tape and saw the crime. The thief pulled up just five minutes after the 12:50 p.m. delivery and stole the package, which was delivered by FedEx, off the porch. 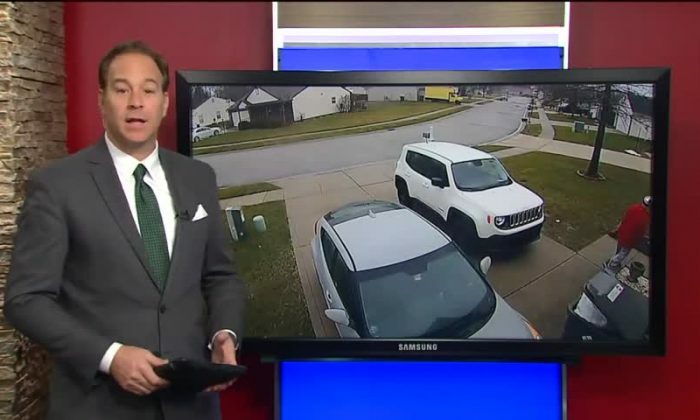 Hall told Fox 59 she believes the thief was trailing the truck and scouting for packages. “It’s not a good feeling. It kind of makes me not want to trust people anymore,” Hall said. A rare black snowflake clownfish was in the package, bought by Upton for his son. “It’s just scary that it is happening not only in this area but in general that people are taking packages that people have spent their money on,” said Upton. The couple has placed calls to local pet stores, warning them that anyone trying to sell such a fish would likely be the thief. The family is hoping someone recognized the man and calls the police, reported WTHR. Nearly 20 percent of homeowners surveyed by home-security company Ring reported having their package stolen in 2016, reported Consumer Reports. The outlet said ways to protect packages include letting the courier drop them off inside your home, although that comes with its own security concerns, or to install security cameras. Other options include having packages delivered to a lockbox and instructing the package delivery companies where you’d like the packages dropped if you’re not home, such as your back door, with a building superintendent, or with a neighbor. “You also can have deliveries diverted to another address—maybe your workplace—or placed on hold if you’re on vacation. UPS provides a list of local partner merchants, such as UPS stores, pharmacies, and convenience stores, that have agreed to accept deliveries on a recipient’s behalf,” stated Consumer Reports.